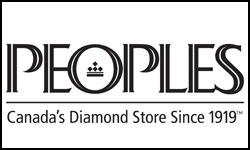 People's Jewellers is Hamilton's diamond store! Exclusively at Peoples, you can find the Celebration Canadian Diamond(R) with 100 facets! From engagement rings to titanium men's jewellery, you'll find the perfect jewel at Peoples! Shop rings, necklaces, bracelets, earrings, and more at CF Lime Ridge.